Tight squeezes and awkward angles are no match for this stepless ratchet. The lightweight, compact design is perfect for the numerous jobs that are too big for a traditional ratchet. Because it’s stepless, this ratchet can start from any angle. 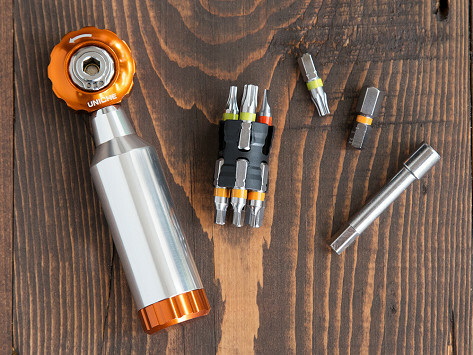 Use the removable tool head as a finger ratchet, or pop on the extender for more accessibility—and all of the interchangeable tool bits store conveniently in the handle. Includes ratchet tool, 55 mm tool bit extender and interchangeable tool bits; hex: 2, 2.5, 3, 4, 5, 6, 8 mm; star-shaped: T10, T25, T30; phillips & flat-head. Fits all standard US sized bits including 1/4"
Dimensions: 7.6" x 3.14" x 1.25"
Make a good tool a GREAT tool! After using this tool a few times, I could tell it was well made. As a contractor, I have 2 suggestions to make this tool even better than it is! First, I would make a second handle with one female threaded end, and one male threaded end. Caps would go on both ends, the space inside could have a second bit holder that could hold your own set of bits. When you remove the cap on the end with the female inside threads, the open handle could screw onto the first handle making it an extended handle. A 1/4 inch hex protrusion on the inside of the removed cap could then be inserted into the empty socket of the main tool helping to stabilize the tool; start the screw easier; and store the spare cap. It could also double as a finger drive for the tool without removing the head of the tool from the body. Keep the same type of rare earth magnet in the second cap on the other end. If I were a machinist, I would already have this improvement! My spouse says this is a great improvement on an old idea. He just loves the convenience and time savings. Can't keep in my toolbox as I want to keep it when I need it. Easy to keep hidden and works on everything! I got this for my boss and he loved it. He does a lot of bike racing and said he will take it with him to each race. Great tool for everyone that rides a bike !!!! With its compact, durable design, this multi-tool can lend a hand anywhere you need it.